Governor Paul LePage delivers his final State of the State address before a joint session of the Maine Legislature in Augusta on Feb. 13, 2018. AUGUSTA, Maine — Gov. Paul LePage announced Monday that he would appeal a ruling in a long-running legal battle with Attorney General Janet Mills to Maine’s high court — about two weeks before the Nov. 6 election in which she is the Democratic nominee to succeed him. It’s the latest salvo between the Republican governor and the attorney general. The core issue is somewhat spun off from a case in which Maine Superior Court Justice Michaela Murphy ruled against the governor in October 2017 in a case over Mills’ refusal to pay his office’s costs for weighing in on federal legal issues. It comes after a survey released this weekend showed Mills pulling ahead of Republican Shawn Moody in a tight, four-way race to succeed LePage as of early this month in an unsettled race that has seen $7.7 million in outside spending but scant polling since the summer. 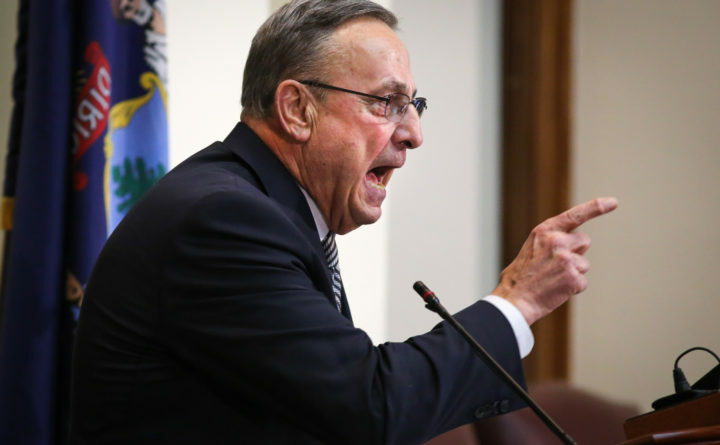 LePage issued a statement lambasting Mills on Monday evening, accusing the Democrat of “rogue and unscrupulous behavior” and “cronyism.” Mills’ office didn’t immediately respond to the governor’s announcement, which came just as state business was closing Monday. Last year, Mills and LePage took opposite positions on a fight over President Donald Trump’s decision to wind down the Deferred Action for Childhood Arrivals program, which shields immigrants who were brought to the U.S. as young children from deportation. A federal judge left it in place earlier this year, but he said it is likely unconstitutional. Mills joined California’s lawsuit against the Trump administration over DACA, but LePage disagreed with her and sent a letter saying her office couldn’t enter the lawsuit without approval from the governor or Legislature. She responded with a letter noting precedent from the Maine Supreme Judicial Court saying the attorney general can “maintain all such actions and proceedings” as they deem necessary. LePage sued Mills in state court over that move in October 2017, arguing that Mills’ actions violate a section of Maine law that seems to force the attorney general’s office to gain the permission of the Legislature or governor to appear in tribunals other than state courts. Mills is running against Moody and two independents — State Treasurer Terry Hayes and consultant Alan Caron — in the race to succeed LePage.